Performer, 2017, photography lens, LCD TV, dimensions variable. By using the unique characteristics of blue screen postproduction images, real life dancers dressed in blue guide the audience in swinging its bodies and doing a double dance, creating a strange viewing experience. The audience may leave its e-mails when requesting for recorded images. Body movements on movie blue screens and reality games bring the audience’s bodies onto a virtual stage, where the audience can showcase its unique movements. The aforementioned approach transforms digital media guidance to man-to-man interaction, enabling the audience to become both the audience and performers. Order or Dance 2017, 2017, interactive installation, dimensions variable. Order or Dance 2017 is a dancing game on a stage without performers. The focus of this game is on the instructions given by the game’s electronic equipment, in which somatosensory data are utilized to develop the game. The interactive dancing game uses the movements made by players (according to the directions and symbols displayed at the lower right of the screen) and combines it with a character video to create a dance rhythm. However, as the symbols and the video work simultaneously, deviations occur. Such deviations highlight the gap between the use of dance symbols and the “reproduction” of these symbols via the human body, illustrating the ineffectiveness of electronic equipment in issuing 2D dance instructions. To solve the aforementioned problem, artists rearrange symbols used in various dance-based somatosensory games and convert them into instructions in self-created games. These broken instructions lose their bond, speed, and rhythm, raising the following question: Is this a somatosensory game, a system of instructions leading to the next step, or a dance? 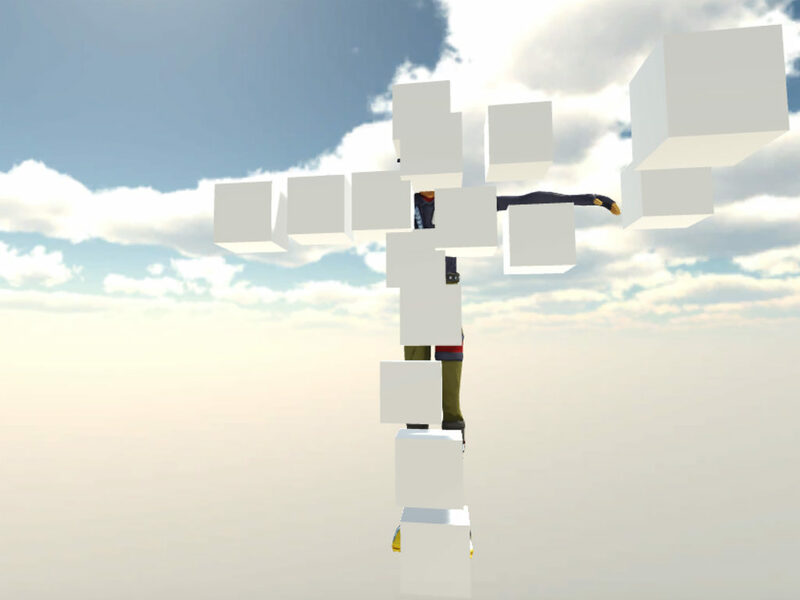 Players move their bodies based on their understanding and imagination of the instructions; players score if their movements match the preset movements. Because players’ understanding of the instructions and their eye–body coordination differ, their scores differ.